He carries a smartphone on his hip, goes out for burgers and plays pickup hoops. She goes to their daughters' soccer games, works in the garden and loves listening to her iPod. Together, they host poets, artists and musicians at their house and invite neighborhood kids to drop by. 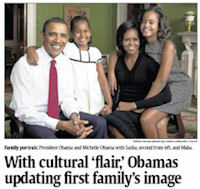 USA Today’s Maria Puente has proven herself to be a eager member of the Michelle Obama Fawn Club. You could call it "Obamalot." That makes some sense. The incoming presidential couple, Barack and Michelle Obama, bear superficial similarities to John and Jacqueline Kennedy of the 1960s "Camelot" White House — charisma, vigor, her fondness for sheath dresses, for instance.